The Museum collection includes at least 7 phonographs that play either wax cylinders or records. Click the image for more information about this wax cylinder phonograph. Thomas Edison was not only a famous inventor but also a savvy businessman. While trying to create an “answering machine” to record phone messages, he invented the tinfoil phonograph, the earliest machine to record sound. Other inventors experimented with sound reproduction, including Alexander Graham Bell, who pioneered the idea of using wax cylinders instead of tinfoil. Edison, however, improved upon this idea and was able to bring phonographs to the masses in the late 1890s by streamlining the technology and making it more affordable. 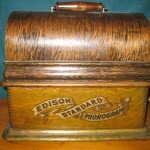 His Edison Phonograph Company had the market cornered on wax cylinder phonographs until record phonographs overtook them in the 1910s.